Yet more Shabaka Hutchings, the sax player and bandleader currently making waves by travelling the London spaceways. 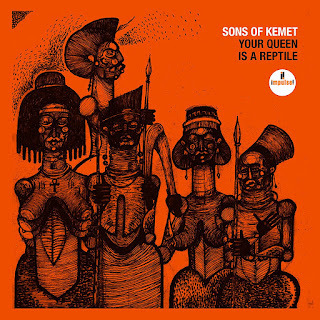 With a firm feet in the now, his Sons Of Kemet dig deep into cosmic territory. Your Queen Is A Reptile was released on the legendary Impulse imprint, trademark of quality since Trane, Mingus, and Pharoah strutted their stuff there. Good company.